I'm finding it a bit of a struggle at the moment to keep on top of all my projects and making time for my family, so blog posts are going to be few and far between and short and to the point. There are quite a few things I need to post about right now, but priority is family and actually doing artwork. I hope to be able to get out and paint on a wall soon and make a start on all the canvases I need to get done! 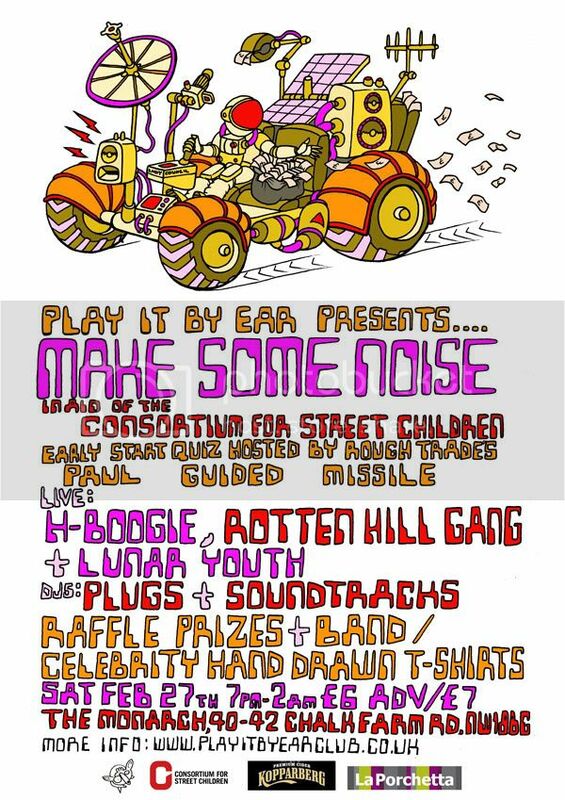 Anyway, here are the two latest poster designs I have done for Play It By Ear club, Camden, London. 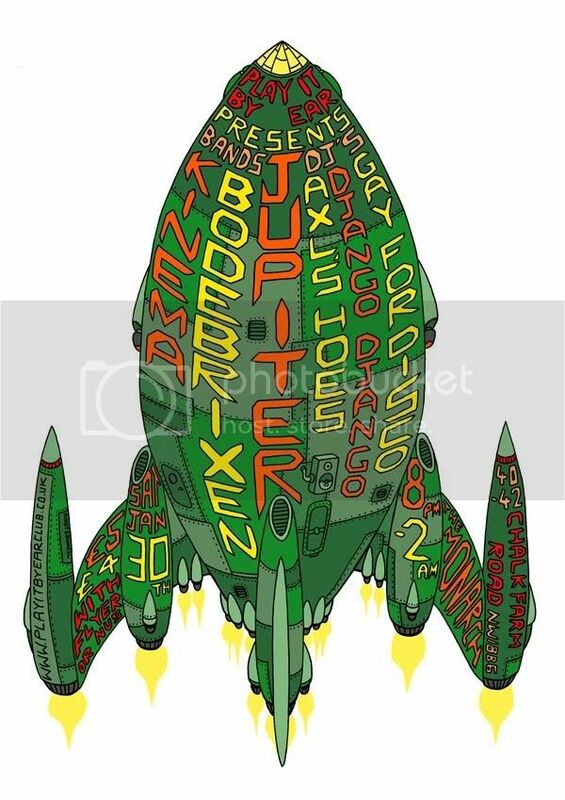 As always, the imagery is kind of inspired by the band names. Both posters have a space theme. I think the Rocket is the stronger of the two. I'm not keen on the colourways on the buggy. 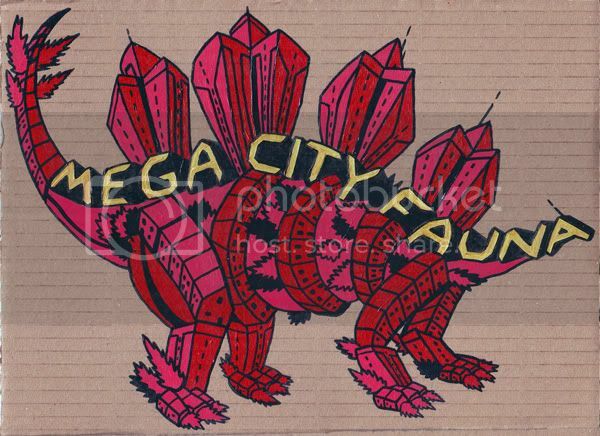 It's been a while now since I have posted anything on the blog and in that time my Mega City Fauna exhibition has come and gone. The show has been a great success and I have been meaning to put up some pictures for it for some time now. Part of the reason i haven't is that it took alot of me doing the show and then had to work on a load of illustration projects straight after. I was going to post some WIP of the show and some pics of the opening night, but there are already quite a few good ones up on flickr and Lokeys blog. Liz and felix for having me work non stop over Xmas and for all their love and support. Dunstan for great photo work on the huge one and a lovely print. Josh for his help assembling and hanging the Ultra Bristol Dinosaur. Leigh for last minute quality framing. Rowdy for his help in making the Triceratops head. Cheba, Lokey and Sam at WoC gallery. Jody for words of support when freaking out about getting the show together. Roxy and the library staff. Tails for the dino biscuits. Everyone who made it along to the opening. Last but not least, Ted and Chris who helped me get the huge piece there during the snow chaos. Their van was stuck on the side road by my studio for over an hour and it took the Police and neighbours to get it out of there in the end! 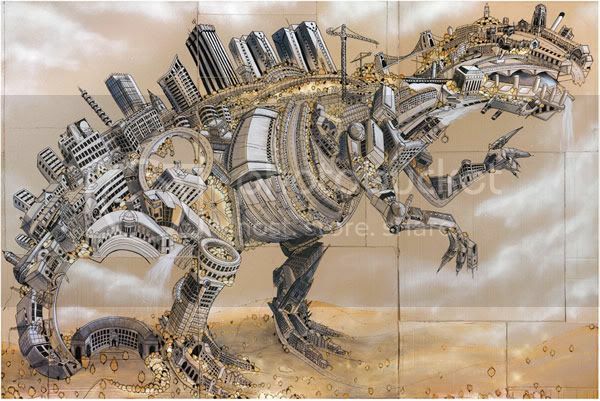 As a result of the show I had an interview on the Juxtapoz blog! Here's a run down of all the Bristol beasts from the show in order. I was going for a kind of Pokemon 'Gotta catch em all' thing, numbering them and making them collectable. 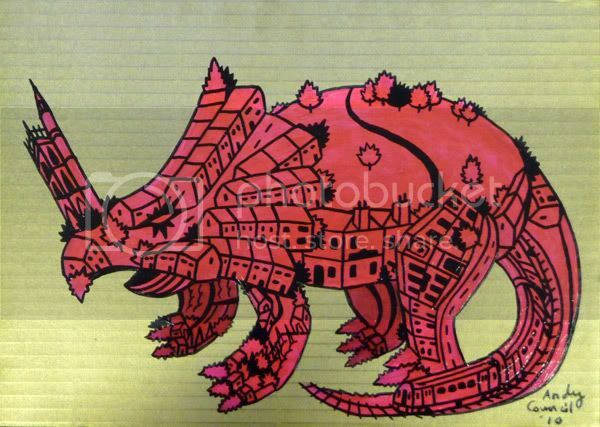 No.1 - STEGAMEGACITYSAURUS. The flyer for the exhibition. 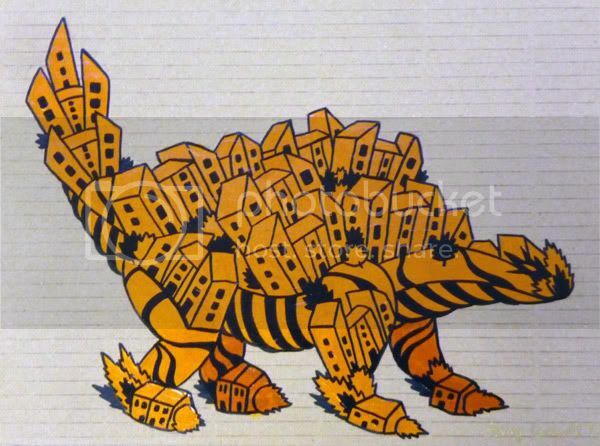 Stegosaurus type beast made of tower blocks similar to those in Barton Hill. No.2 - PLESESSGREATBRITAIN. 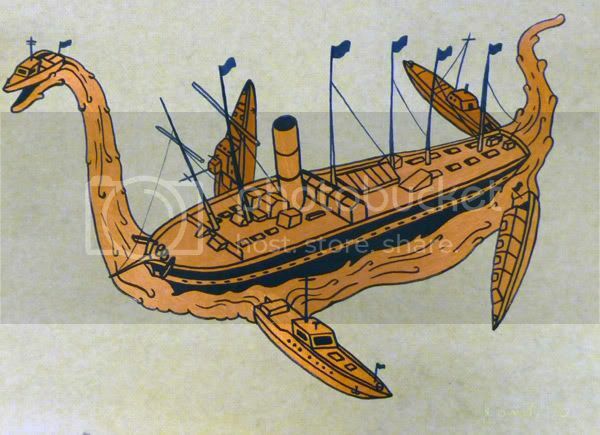 Plesiosaur aquatic monster featuring Brunels SS Great Britain. 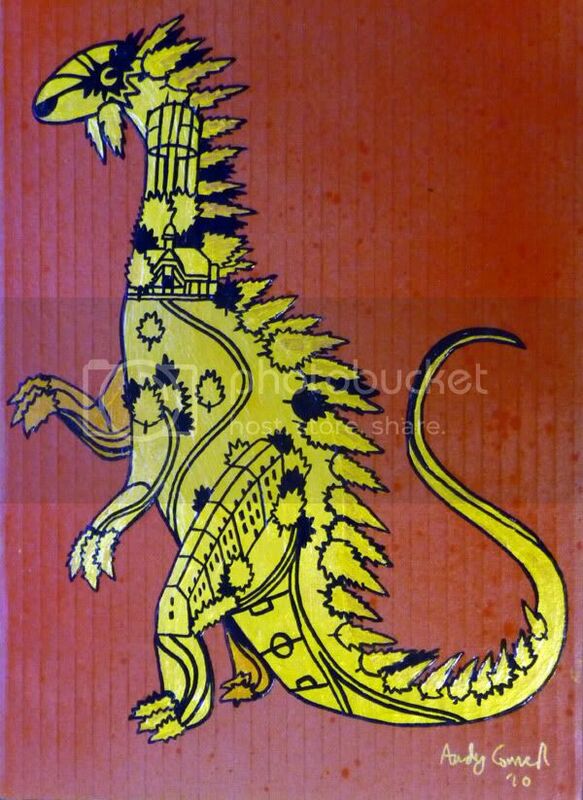 No.3 - DOWNSARGASAURUS. 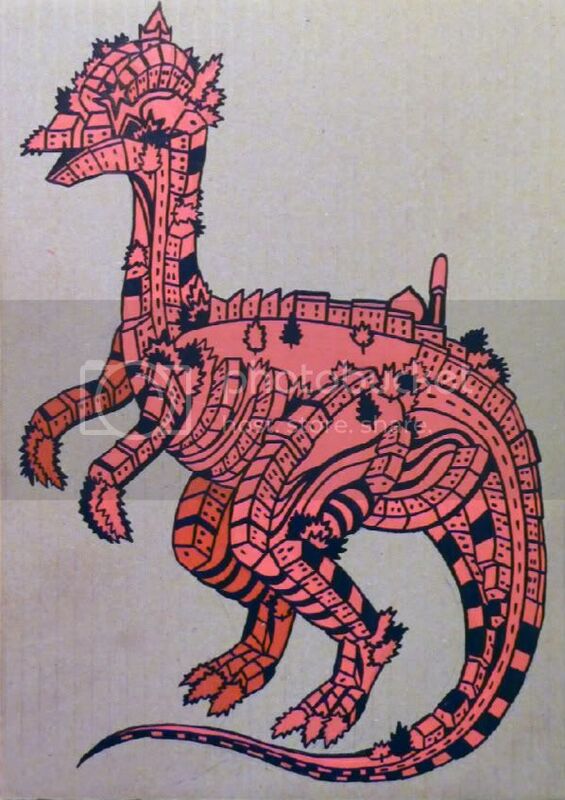 Based on the Downs in Bristol and the dinosaur Amargasaurus. No.4 - SPENSHUNBRIDGEADOCUS. Diplodocus Clifton Suspension Bridge! No.5 - SHOTUSAURUS. Based on the old brewery by the river and the shot tower. The dinosaur is a bit like Limusaurus inextricabilis. 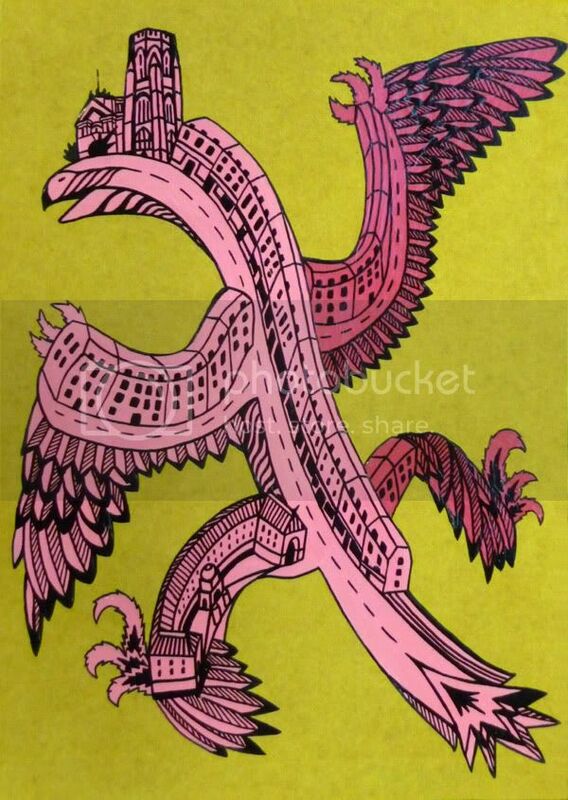 No.6 - PARKAEOPTERYX, Based on the early bird Archaeopteryx and Park Street/College Green. Features the Council building, Wills memorial and Bristol Museum. It looks a bit like a Flamingo! No.7 - DIPLOMEADS. 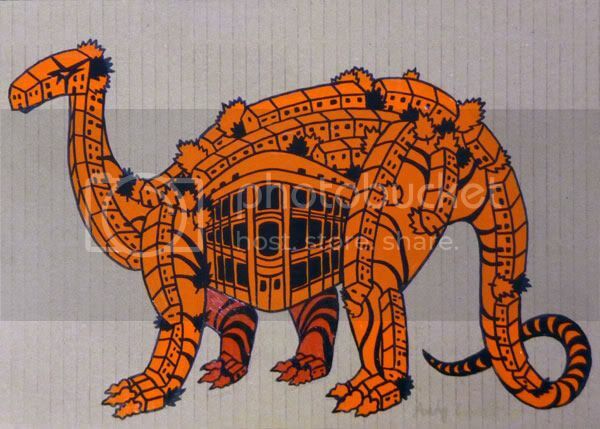 Temple Meads train station Diplodocus. No.8 - LOCKERLOPHUS. This is alot like the view from our livingroom. It is of Lockleaze, Purdown and the telecom tower there. 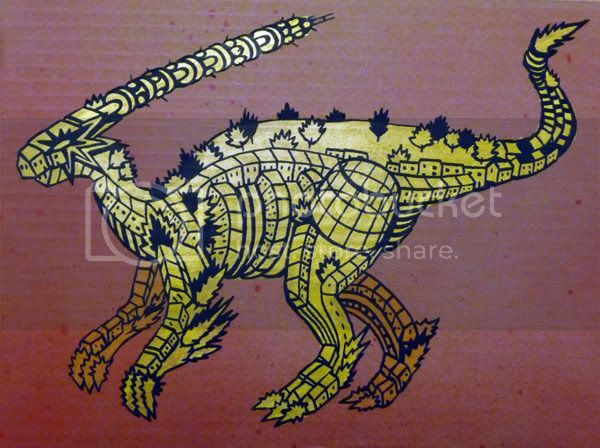 The dinosaur is based on Parasaurolophus. No.9 - BRACHASOUTHVILLE. Brachiosaurus Southville. Features the Tobacco Factory building. No.10 - THERIZWINDHILL. 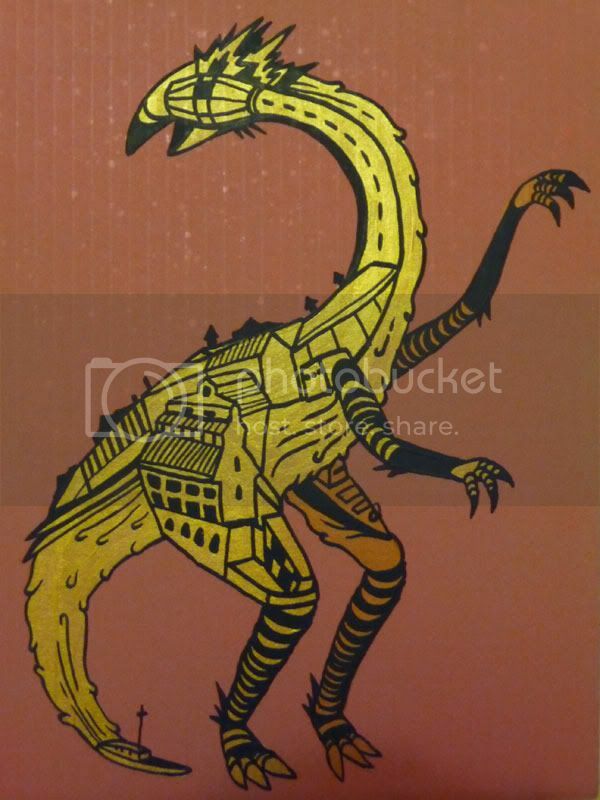 This weird bum grabbing dinosaur is based on Windmill Hill and one of my fave odd dinosaurs, Therizinosaurus. No.11 - TRIDEANERTOPS. 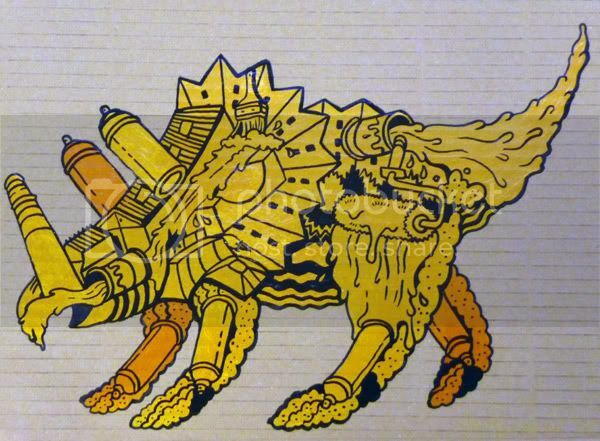 Dean Lane skate park and graffiti hall of fame crossed with Triceratops. No.12 - CABOTCIRCUS REX. 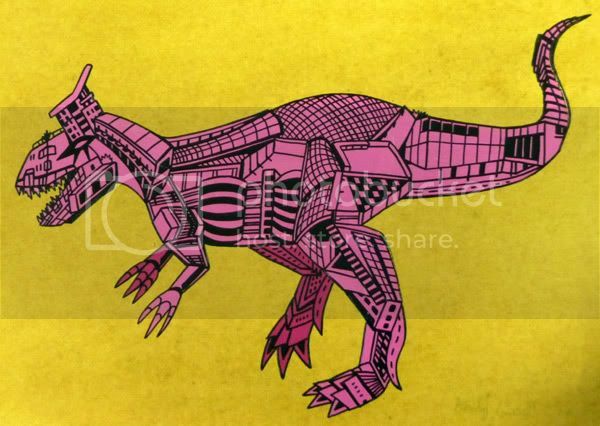 T Rex based on the Cabot Circus hall of rampant consumerism. No.13 - TOTTERDON. 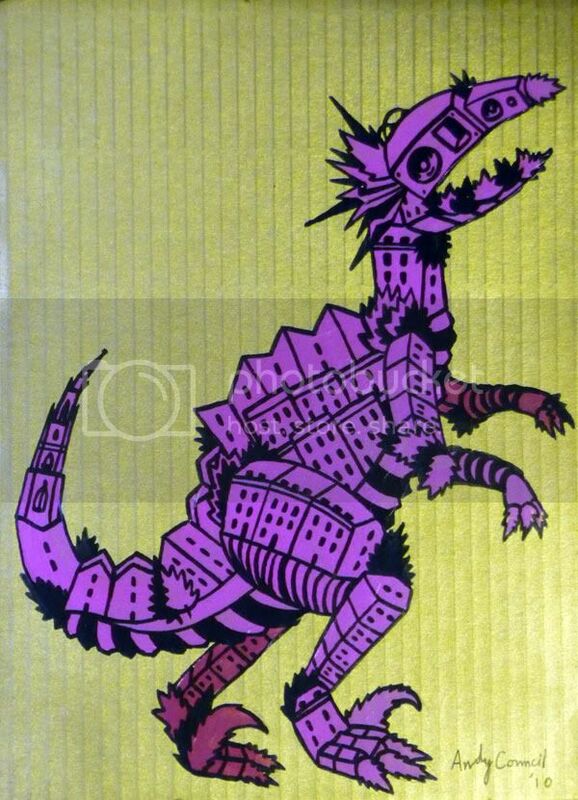 Totterdown Iguanadon. No.14 - BARTONADON. Barton Hill Dimetrodon. No.15 - SAINTPRAPTOR. 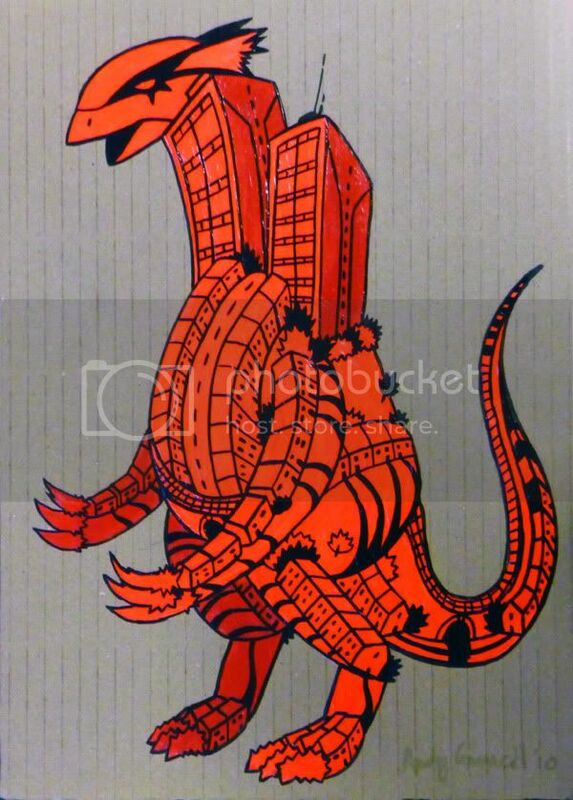 Saint Pauls Velociraptor. No.16 - STEGACHELTSAURUS. Cheltenham Road featuring Polish church and boom box! 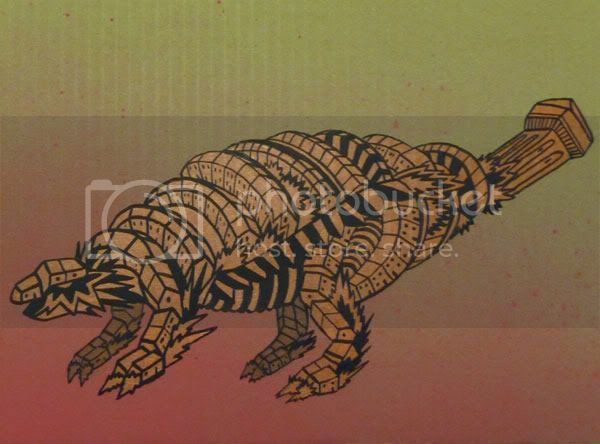 Based on Stegosaurus. No.17 - KNOWLEKYLOSAURUS. Knowle and the water tower. 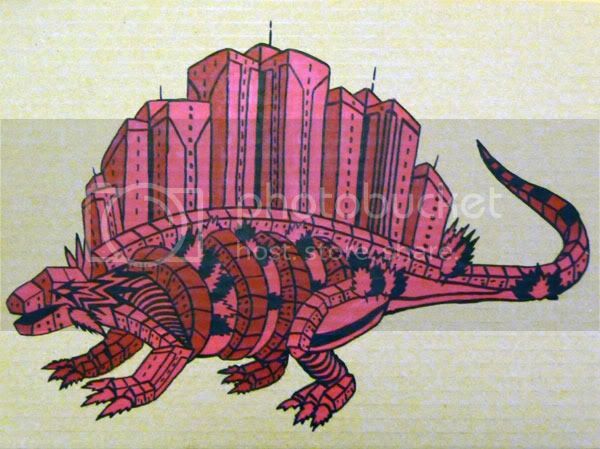 Dinosaur - Ankylosaurus. No.18 - BARTHAEDSAURUS. Bartholomews Square in North Horfield. 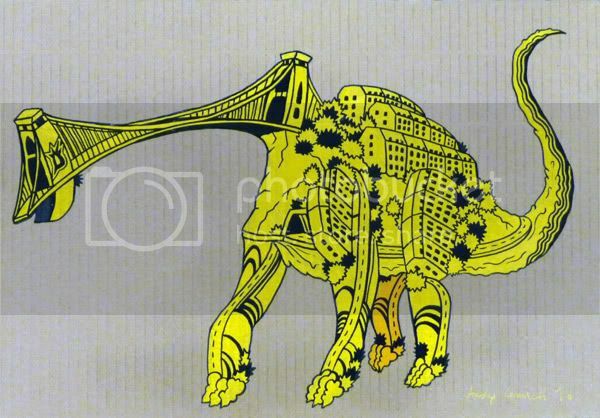 Armoured dinosaur...can't remember what one it was based on. No.19 - CONCORPHODON. 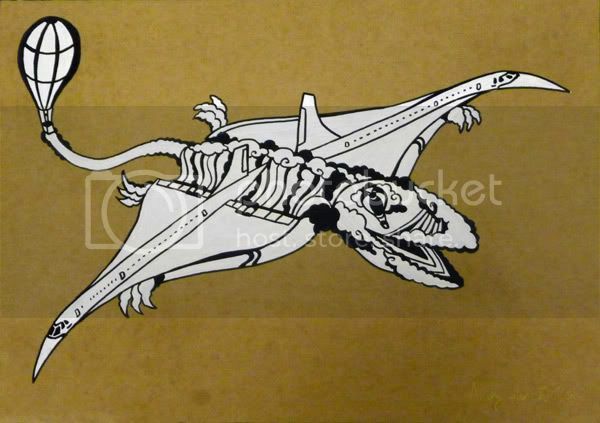 Concords and Balloons in a Dimorphodon flying dino shape. Looks a bit like Zippy. No.20 - WERBATOPS. 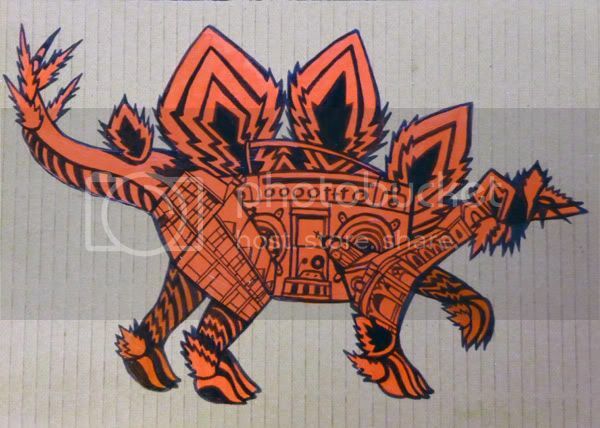 Saint Werburghs Triceratops. 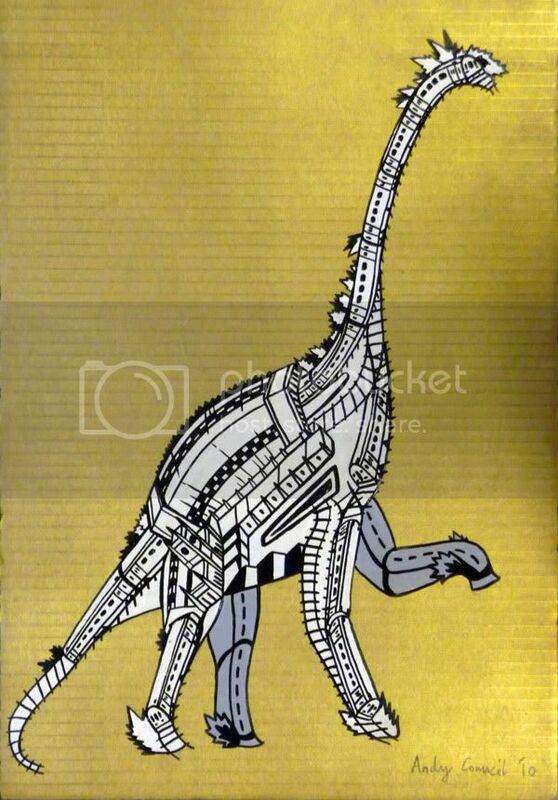 No.21 - ULTRA BRISTOL DINOSAUR. Couldn't think of a better name for this 12ft x 8ft monster which includes most of Bristol! Photo by Dunstan Baker. st werburghs - ehup, wheres our cuppa! !